The Ionian Sea is the sea that wets the western coast of the Greek peninsula. The geographers of antiquity called the Ionian Sea or Poros. Before getting this name was called Sea of ​​Cronus and Rhea. There are various versions about the origin of the name. In the view of Theopompus, historian of 4th century BC from Chios, who lived in Athens, the name comes from a hero of Illyria, Ionio, who is not likely came from Illyria, but the island of Issa Dalmatia. According to another aspect the name comes from the Ionio, son of Dyrrachos, which was accidentally killed by Hercules, the demigod when he helped Dyrrachos to face the onslaught of his brothers. His body was cast into the Ionian Sea and that’s how the sea was named. Aeschylus wrote that the Ionian sea took its name from Io, the beautiful daughter of Inachos and the nymph Melia, who was chased by Hera. Io is the central figure of one of the most imaginative Greek myths. Zeus fell in love, who copulated with her assuming the form of clouds so his wife couldn’t understand. But Hera, learned the antics of the king of the gods, he learned his new adventure and transformed Io into a young cow. To prevent Zeus from seeing her again, he put the horrible Argus to watch them. But Hermes killed Argus after command of Zeus. Hera then sent Oistros, the fly of sheep and goats, biting Io constantly, so that Io had to change places all times. After long wanderings Io came to Egypt, where she assumed human form again and gave birth to a son of Zeus, Epafos. The myth, like most myths, has many variations and the ancients mention several names of places, from where Io passed. One of them is the Ionian Sea. The Ionian Sea resembles a triangle. Its area is not exactly defined. At the international level has been accepted that begins at the north from the Strait of Otranto, between Cape Otranto in Italy and Cape Ligkouetta of Albania to the south and ends at an imaginary line running from Cape Passero in South Sicily to Cape Tenaro in Peloponnese. In Greece it is considered that the threshold reaches east to Elafonissos in the Laconic Gulf and the islands of Kythira and Antikythira and south to the western coast of Crete. 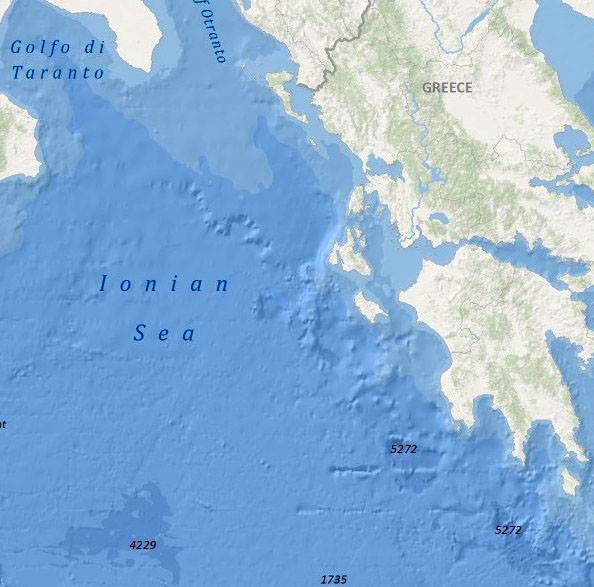 The width of the Ionian Sea in the north is 40 miles and in the southern section, assuming that is the eastern boundary is Elafonisos near Cape Maleas, 360 miles. Its length from north to south is 300 miles. The narrow part of the north communicates with the closed Adriatic Sea and the flat portion in the south to the Mediterranean Sea. Along the coast lie the Greek Ionian Islands. The southern part of the Ionian Sea covers a large part of the Basin of the Central Mediterranean Sea, where the Mediterranean has the greatest depths. The basin is located between Kefalonia, Sicily, Cyrene in North Africa and Crete. The depths of the Ionian Sea in the northeast of the central Mediterranean basin is large, because at the bottom there's a big long rift, which marks the boundaries of the area where the African plate sinks beneath the Eurasian plate. The rift passes south of the island and turns northwest to the Ionian Sea, passing west of the Ionian Islands. The islands are separated by oblique rifts. In the same way, they separated from mainland Greece. The great Ionian rift is the main cause of frequent earthquakes in the region. The greatest depths measured at the southwest at Cape Tenaro of Oinouses shaft, at the small islands Shiza and Sapienza, near the south coast of the western peninsula of Messinia. Previously the deepest part of the Mediterranean considered to be 62 nautical miles southwest of Tenaro, where the depth is 4846 meters. Then, farther north, approximately 30 miles from Oinousses, the depth was measured 4,901 meters. Recent measurements have found a depth of 5,090 meters, 75 miles of Tenaro. And even more recent, south of the cape, the depth is 5,272 meters. 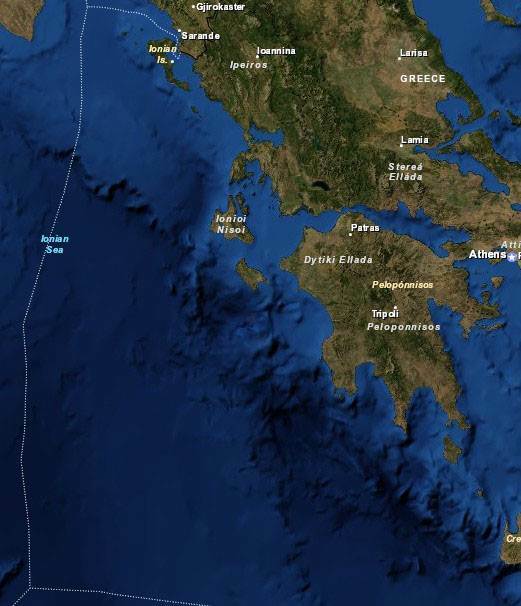 North of this basin are two other basins, one south of Zakynthos and the other southwest of Kefallonia. In these areas, depth exceed 4,000 meters. The Himara Sea, north of Corfu. The Sea of Paxos, south of Corfu Sea between Corfu and Lefkada. The Tilevois Sea or Tafia Sea between Lefkada and Aitoloakarnania in mainland Greece. The Sea of Echinades, between Cephalonia and Ithaca. The sea of Patras bay and the Sea of Kythira.